What’s better? 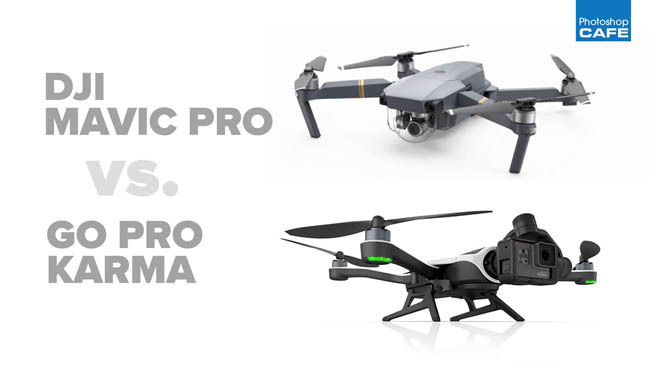 GoPro Karma or DJI Mavic? A lot has happened in the portable drone world in the past week. Last week, Go Pro announced their long awaited drone, called the Karma. A week later DJI cut them off at the pass with the DJI Mavic Pro. It was interesting to watch the GoPro CEO pull out the Karma from a bag in an (overly) dramatic way while shouting like a man who had just discovered fire for the first time. Then a week later, in a (too much like) Apple style keynote, DJI pulled a bag out on stage and then as if to stick it to goPro, said, “no it’s not in the bag”, and proceeded to pull it out of his back pocket. Watch the live events here if you haven’t seen them, than continue for my head to head spec battle. 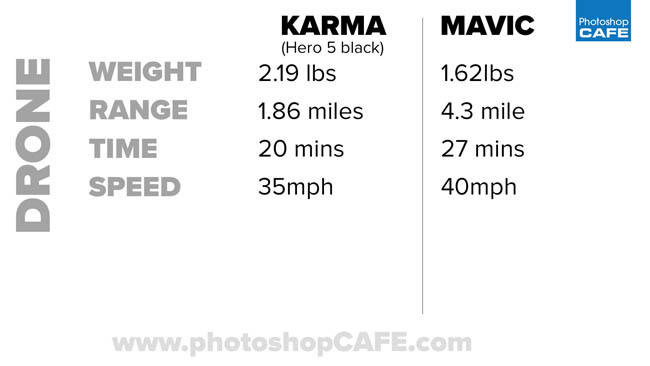 As you can see the Mavic beats the Karma in every one of these specs. Keep in mind, its illegal to fly beyond visual line of sight in the USA, so the range isn’t as important as you might think, the important thing is having a clean sharp image and signal it maximum legal range (Probably somewhere between 1000-2000 feet). Another disclaimer, you should be landing your aircraft at no lower than 20% battery, so expect closer to 20 mins flight on the mavis and maybe 15-18 on the Karma. At the end of the day, the camera is the most important part. 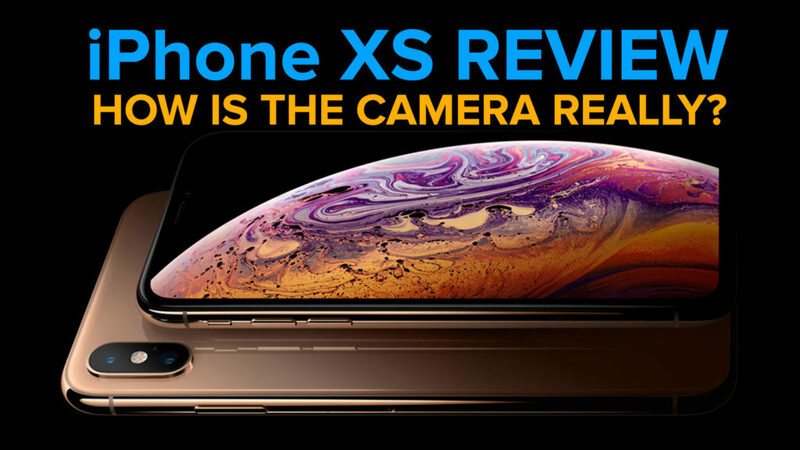 How to the cameras compare? 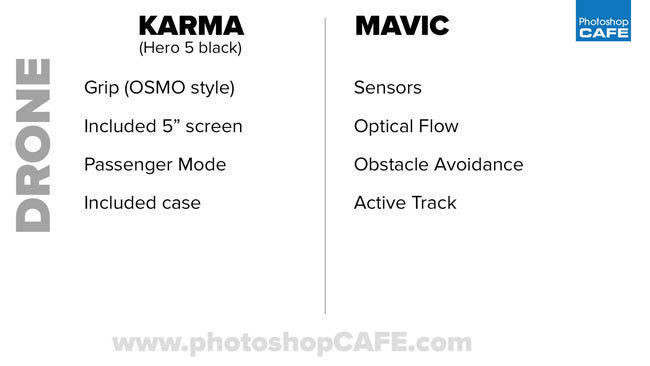 Karma comes without camera, but there are 2 package available, with the Hero 5 Black edition and the Session 5. It also supports existing Hero 4 cameras. For this shootout, we will use the Hero 5 Black, which is what I would recommend. 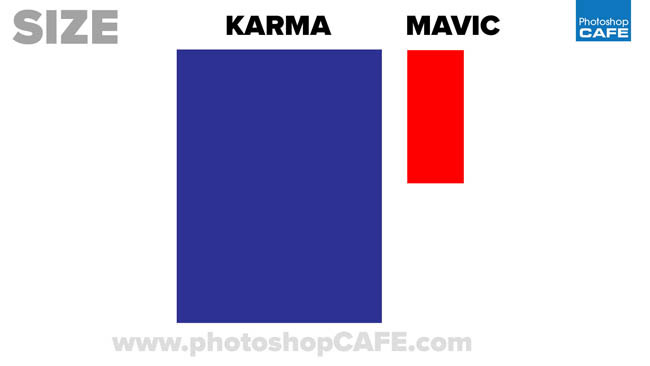 You can see that the Karma actually offers a lot more features on the camera. Then again, DJI has been making drones a lot longer, but GoPro have been making cameras a lot longer. I will do a comprehensive camera test in the near future. 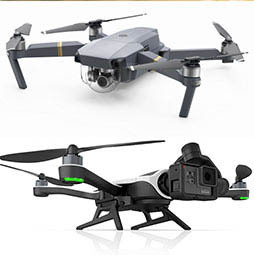 For now, Casey Neistat has done a comparison and the Mavic is “good enough” but not as sharp as the Phantom 4. It looks like the Hero 5 could possibly be sharper than the Mavic, but until I get a review unit I can’t conform, but check out the video here and see the comparison on the last part of the video. He doesn’t do a photography comparison, but I will do one as soon as I can. 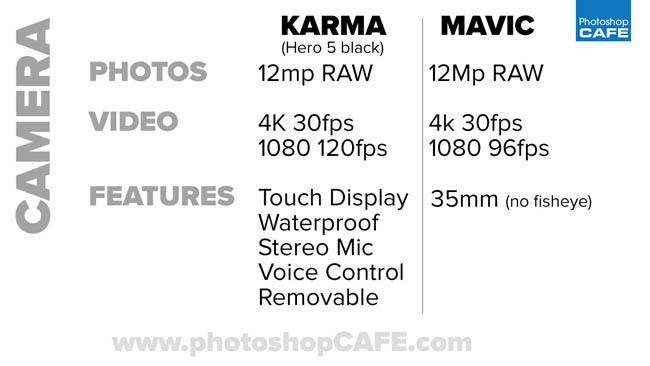 Im glad both shoot in RAW. 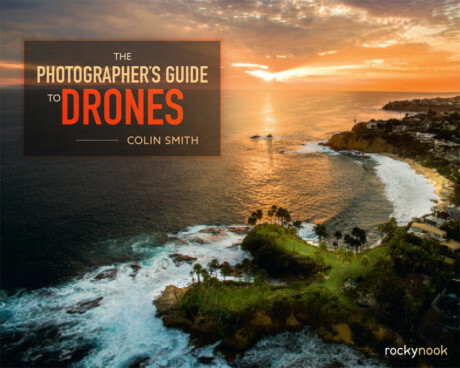 Michael Shainblum says Casey’s camera wasn’t focused and claims the Mavic is just as sharp as the Phantom 4. The Karma comes as a kit which includes the GoPro Grip. 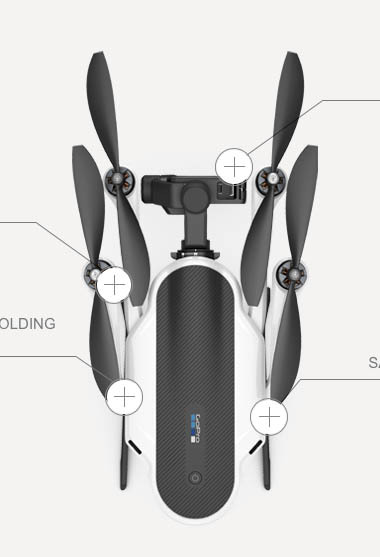 The camera and gimbal are removable (Inspire 1 style) and can be mounted to a handle called a grip. This allows for stabilized hand-held shooting. 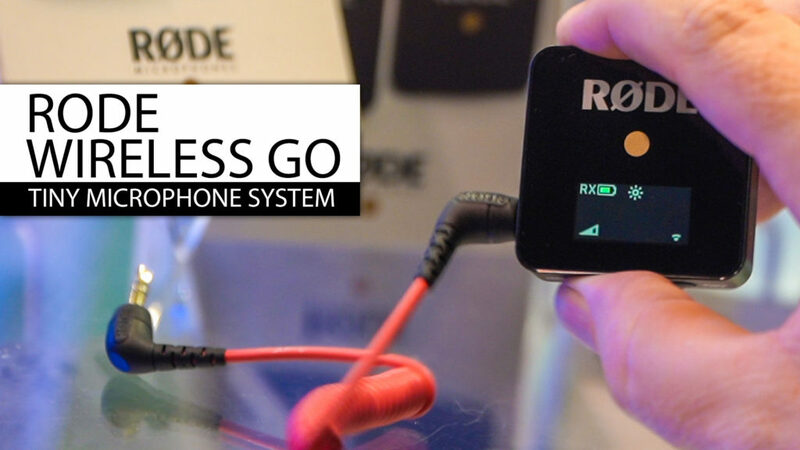 This is very similar to the DJI OSMO system. This does add a lot to the package and in some ways I like this better than OSMO because the camera has a screen and you can start shooting right away. The Osmo has to connect to a mobile device through wifi so you can see what you are shooting. It also comes with passenger mode. This allows a second person to connect to Karma through their mobile device and take control of the camera. This is a little bit like theInspire 1 second operator, except the Inspire 1 has a full 360 degrees of motion control where as the Karma only has 90 deg tilt. The big thing here is the sensors. 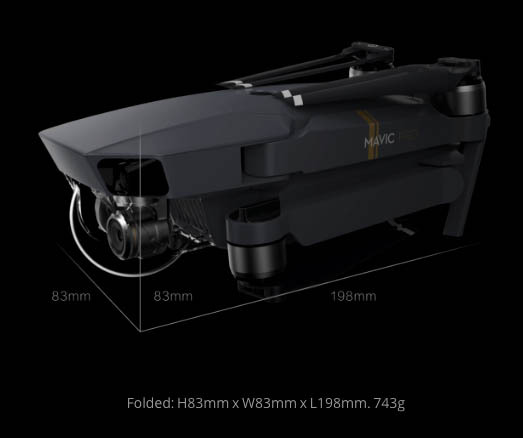 Mavic has Optical Flow which allows for very stable indoor flight. It also has downward and forward facing sensors for obstacle avoidance and object tracking, just like on the Phantom 4. You can see that in operation on the Phantom 4 here (Almost identical to the Mavic). This Mavic can fly itself, and detect and follow an object while avoiding things like trees. 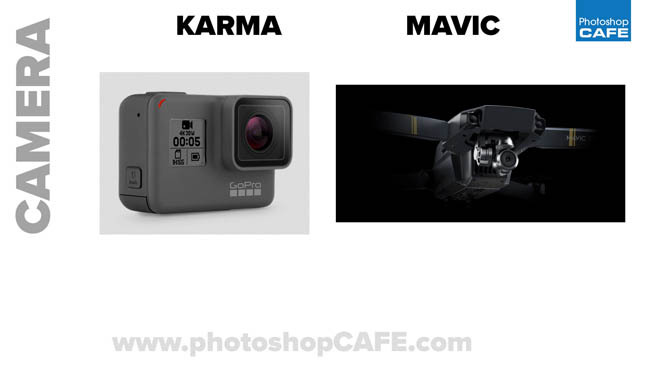 I heard people say that the Mavic killed the Karma on price. I don’t agree, it depends. At $799 the Karma doesn’t have a camera If you already own a GoPro 4 or 5, then you are fine, so this is appealing to GoPro customers, however, if you need a camera, you can get a package that comes with the goPro Session 5 for $999. The exact same price as the Mavic with Controller. So the pricing is $799 incomplete, $999 complete. For an extra $100 you can get the Karma with a Hero 5 black edition that brings it to $1099. That’s $100 more than the Mavic, but not really. Don’t forget, you also need a mobile devide to fly the Mavic, but the Karma comes with a screen in the controller. Speaking of controllers, the Mavic is large enough to hold and iPhone 7plus. Karma will set you back $99 for extra batteries ($89 for Mavic), I recommend 3-4 batteries for some good flying. The GoPro Karma also comes with a carry case (extra on the DJI). 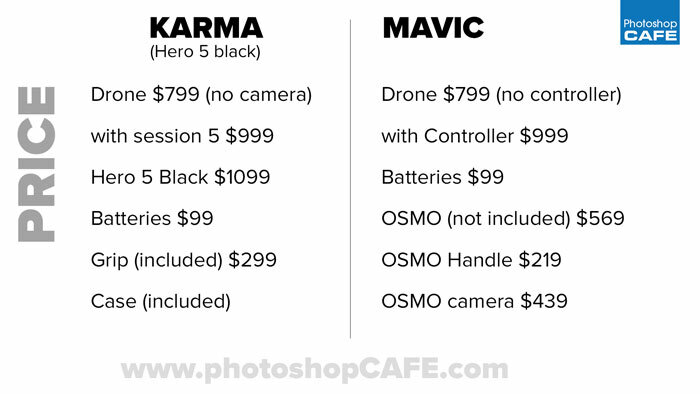 The big price difference is that the Karma comes with the Grip handle. A DJI Osmo will set you back $569. You can get a DJI osmo handle for $219 like I did and use your existing X3 or X5 camera on it. See my review here of the X5 on the Osmo. The camera on the Mavic isn’t detachable like the Inspire 1, so you will need a camera for the OSMO. It really isn’t an easy answer, It really depends on what you want to do with it and what you already have. My thoughts at the moment. The Mavic is the better drone, smaller, lighter, better range speed and sensors, actually as far as the drone itself, its not even close. 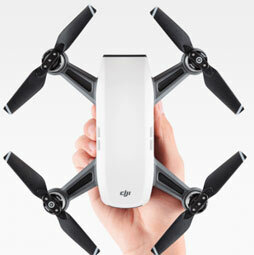 DJI make the best drones in the world, period. The camera? The jury is out on that right now, I need to field test both before I give my conclusion. Value for money? I have to give this to GoPro, the Karma with the controller and screen the grip handle system and included carry case really is good value for money. Stacking everything up at the moment, I’m getting myself the Mavic, but Ill keep you posted as I test the Mavic and the Karma and get more information. 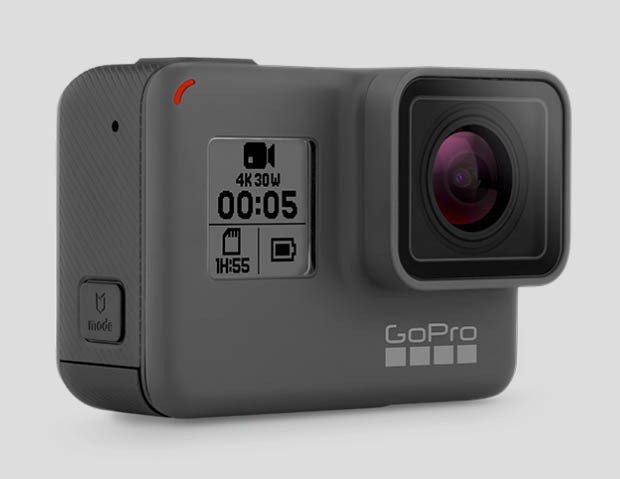 Update 2: GoPro have issued a recall on all 2,500 Karma’s sold because of a power failure causing crashes. Best comparison review I’ve seen yet Colin. 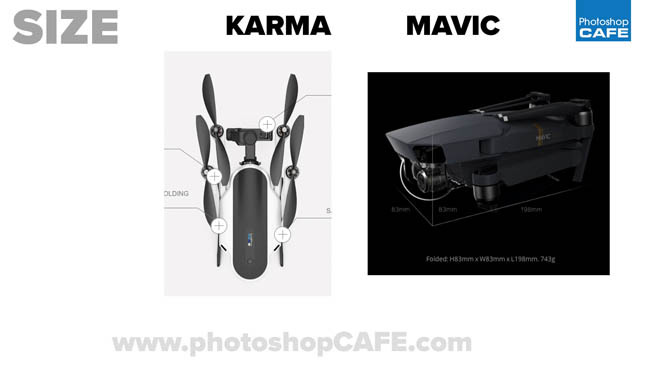 At this point I have to agree and think the Mavic will be my choice but either will serve well. One thing I’m noticing on the Mavic, particularly in the video footage is what appears to be an exaggerated color pop especially in the reds. This can be tamed down in post but looks to be different than raw footage in the Phantom 4. Thanks. As soon as I get one, Ill be testing the camera.